While Javelinas look and behave much like pigs, they are not closely related. The Javelina is a hairy, pig-like animal approximately a foot-and-a-half tall with an oversized wedge-shaped head fitted with small ears, weak eyes and a tough, disk-shaped snout. An adult is 35-55 pounds and has a small rump terminating in a short tail. A Javelina’s mouth has two tusk like canine teeth used for self-defense and for cutting roots. Javelinas get their common name from these tusks, which comes from a Spanish word for spear, but Javelinas are actually collared peccaries. The “collar” is a pale stripe of fur that rings its shoulders. While Javelinas look and behave much like pigs, they are not closely related. Pigs are native to Europe and Asia. Peccaries are the only pig-like species naturally occurring in North or South America. Peccaries are a tropical animal with their core population in South and Central America and Mexico. The U.S. population of Javelinas, numbering about 60,000, is at the northern end of peccary habitat range and they occur only in southern Arizona, Texas and New Mexico. Archaeologists say no peccary bones show up in digs at levels prior to the 18th century in this area. Javelinas arrived shortly thereafter by migrating north along river bottoms. Prickly pear cactus is a major part of their diet and along with succulent plants. Javelinas eat fruits, nuts, berries and bulbs. Javelinas breed year-round and after a five-month pregnancy, usually bear a litter of two. They live in parties of approximately one- to two-dozen individuals with a strict pecking order and practice group defense. 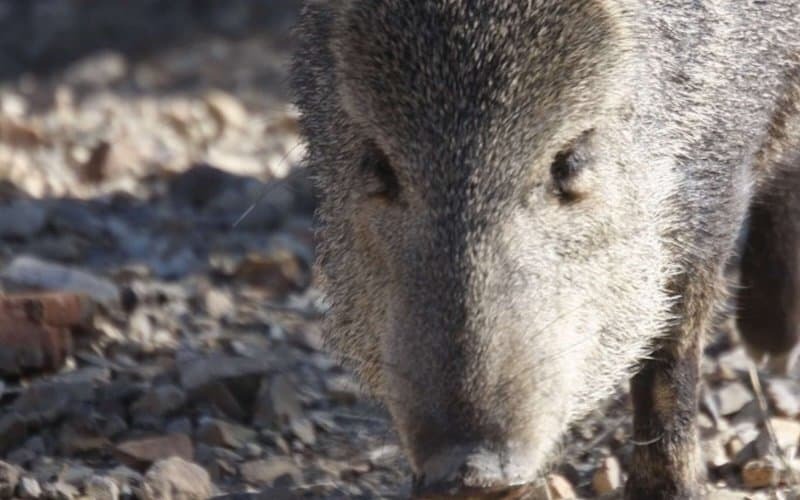 Unless threatened, Javelinas ignore humans, but aggressive dogs often end up badly injured. Their natural predators in the Sonora Desert are coyotes, bobcats and cougars.